The proceedings of 2016 IRCI Experts Meeting which is outcome of the meeting has been opened to the public now. 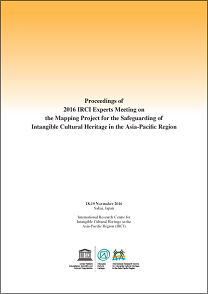 You can see discussions on the current research trends and issues of the safeguarding of intangible cultural heritage in the Asia-Pacific region in this proceedings. ※The PDF version has been added to “Reports & Publications” and is available for download.